Our product range includes a wide range of Jewellery Showroom Bags, Photogenic Bags, Flexo Printed Bags, Multicolour Printed Bags, Custom Printed Bags and Soft Loop Bags. 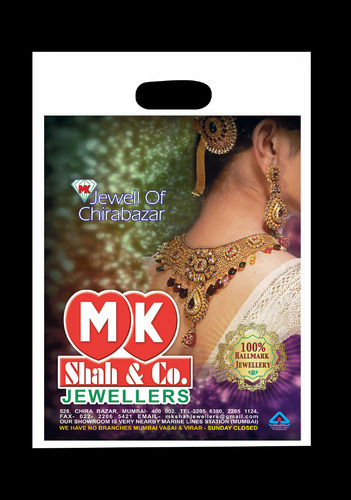 Promote your mesmerising ornaments on your bags or your brand ambassador & keep it changing everytime at never before prices due to the latest technologies & even modern machines. Enjoy unmatched clarity & printing sharpness in an infinite range of colours at an unmatched value.Call us for more details. Eco friendly bags also available. :This type of bags can be termed as cheap n best bags.Flexo printing can be basically termed as line work printing which can provide a simple n sober l;ook to your brands,products or institutions.Coupled with D punch,this bags can be the most economical ones. From printing your bags in an infinite range of colours with crisp sharpness & unmatched clarity,multicolour printed bags are a marvellous one. Also good for small quantities,thanks mainly to the imported state of the art machines.Technology that enables printing on both sides i.e. front & back of your bags,giving your brand a big boost. Bio degradable bags with multi colour printing also available on request. Now-a-days advertising is must for any brand or product. Company spends lots of money for advertisement but there is also another cheap and best way to advertise your brand, company, etc. we provide you the best quality in photogenic bags. We are one of the well known plastic bag provider across the nation. We make these bags with eco friendly and best raw materials, fine colors and latest technology. You don't have to compromise with quality and finishing. Photogenic plastic bags will help you and your business to grow because these bags will do publicity of your brand, showroom etc. The bags provided by us will be eye catchy with fine finishing, dust and moisture resistant. We are apt in putting messages or symbols in the most effective manner. These bags are light in weight and easy to carry. We are capable enough to take bulk orders and small orders too. We assure you that we will give you best deal with best quality. No need to compromise order now. Even though the bags are cheap, our range of Flexo bags has a huge demand in market. Flexo printing can be basically termed as line work printing which can provide a simple and sober look to you brands, products or institutions etc. There is an assortment available for different sizes, styles and colors. Our rates for these bags are very affordable. They are also known to be the most economical bags. State your message in a professional, high impact and creative manner. Custom printed bags offer practical solutions for packaging your products while promoting your brand at the same time. Available in a variety of styles, colors, and sizes, custom bags can be imprinted with your company name and logo and can be used in a variety of different industries. We assure that our Custom printed bags will be able to do all. We also offer photogenic bags. Our custom printed bags are high on demand because of its best quality and for excellent service. We offer our client wide range of product as well as attractive designs, long lasting and bright in color custom printed bags. These custom plastic bags we provide at very affordable rate with best quality. We also manufacture a wide range of photogenic bags, as per client requirement. This product is also available in different sizes, styles and colors. These bags are light in weight and easy to carry. We are well known leading supplier and manufacturer of a wide range of products which includes plastic soft loop bags. We manufacture these bags from white plastic film. Its design features soft loop handles for carrying convenience and highly strong material to assure maximum strength. We offer 3 products; plastic soft loop bags, plastic soft loop handle bags, colored plastic soft loop bags.